Homepage. This page: A drip-free petrol tin produced by Eversure Accessories in the 50s and 60s. 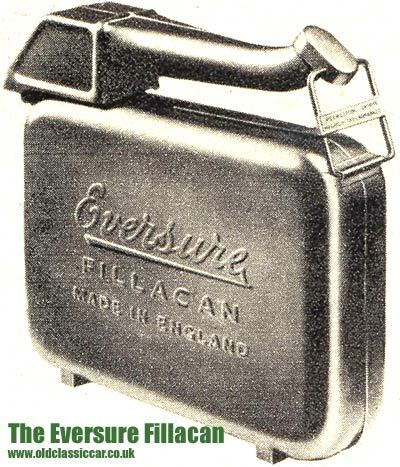 A petrol can produced by Eversure Accessories. I've several of these old petrol tins in the garage, and I've yet to find a better petrol tin. More information on collecting petrol cans, and petroliana in general, can be found on this page. These aftermarket petrol cans were produced by Eversure Accessories Ltd, of Old Hill in Staffordshire. Two versions were sold throughout the 1950s and early 1960s, depending on whether you needed to store one gallon (say if you owned a Mini or bubble car) or two gallons (for owners of Jaguars and Humbers perhaps!). Available in silver, maroon, or blue, the all-steel 1 gall fuel can cost 39/6, and the 2 gall version 49/6. Modern plastic fuel cans are rubbish by comparison. The Fillacan incorporates a hinged steel pourer, which has a built-in filter. The design enables anyone to top up the tank of their car easily, without spilling fuel over the paintwork, especially handy when a car's filler neck is fitted on a horizontal deck panel such as on the Triumph Spitfire. As the pourer is part of the design, it can't be misplaced, ideal when you're stuck on the side of a dark, unlit country lane with the rain beating down. So good were the Eversure Fillacans that I believe BMC equipped some of their Works' rally cars with Fillacans, the two-gallon size I think. I bought a red Fillacan some 20+ years ago when I ran a Mk3 Spitfire, and I've used it ever since on cars such as Series 1 XJs. More recently it has been pressed into service with my A55 Mk2 Cambridge, another car with a filler neck on a horizontal surface. The slim design makes it easy to hold with one hand, while your spare hand guides the pourer. The only slight downside is that it can be kicked over quite easily, although if the pourer neck is clipped in place, it does still seal well.